While working on my Morrowind mod in the Construction Set, I found it difficult to remember what the clothing items looked like. Dressing a new NPC was just guesswork. 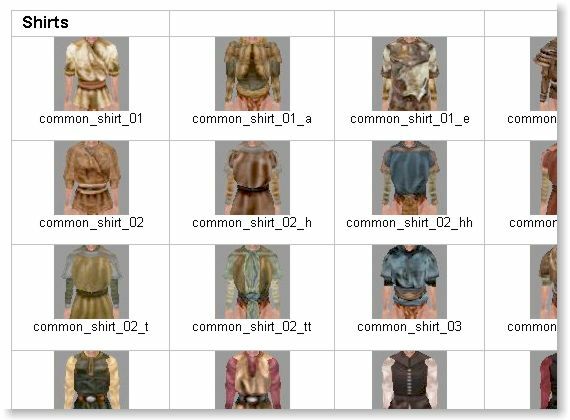 You can't even use the Editor's Preview window since it shows the garments folded up. Not fancy, but it gets the job done. The catalog has been updated to include clothing from Bloodmoon as well as Tribunal. You can download a copy from here. It's a 353KB zip file. The catalog is now also available in PDF format (598KB). Srikandi has put together extensive lists of other objects in the Construction Set including furniture, kitchenware, lights, room tiles, caves and much, much more. You can find the listings here.